↑ Tougard, C. et al. (2001) Phylogenetic relationships of the five extant Rhinoceros species (Rhinocerotidae, Perissodactyla) based on mitochondrial cytochrome b and 12S rRNA genes. ↑ Rabinowitz, Alan (1995). "Helping a Species Go Extinct: The<33 six. Sumatran Rhino in Borneo" (PDF). Conservation Biology. 9 (3): 482–488. doi:10.1046/j.1523-1739.1995.09030482.x. ↑ Robinson, Terry J.; V. Trifonov; I. Espie; E.H. Harley (January 2005). "Interspecific hybridization in rhinoceroses: Confirmation of a Black × White rhinoceros hybrid by karyotype, fluorescence in situ hybridization (FISH) and microsatellite analysis". Conservation Genetics. 6 (1): 141–145. doi:10.1007/s10592-004-7750-9. ↑ Houck, ML; Ryder, OA; Váhala, J; Kock, RA; Oosterhuis, JE (January–February 1994). "Diploid chromosome number and chromosomal variation in the white rhinoceros (Ceratotherium simum)". The Journal of Heredity. 85 (1): 30–4. PMID 8120356. ↑ ୧୦.୦ ୧୦.୧ Skinner, John D. & Chimimba, Christian T. (2005). The Mammals Of The Southern African Subregion. Cambridge University Press. p. 527. ISBN 978-0-521-84418-5. ↑ Rookmaaker, Kees (2003). "Why the name of the white rhinoceros is not appropriate". Pachyderm. 34: 88–93. ↑ "Western black rhino declared extinct". BBC. 9 November 2011. Retrieved 9 November 2011. ↑ Keitloa | Define Keitloa at Dictionary.com. Dictionary.reference.com. Retrieved on 21 February 2012. ↑ Dollinger, Peter & Silvia Geser. "Black Rhinoceros". World Association of Zoos and Aquariums. Archived from the original on 16 July 2009. Retrieved 9 October 2007. ↑ "About the Black Rhino". Archived from the original on 22 February 2014. Retrieved 25 February 2014. Cerdeño, Esperanza (1995). "Cladistic Analysis of the Family Rhinocerotidae (Perissodactyla)" (PDF). Novitates. American Museum of Natural History (3143). ISSN 0003-0082. Emslie, R. & Brooks, M. (1999). African Rhino. Status Survey and Conservation Action Plan. IUCN/SSC African Rhino Specialist Group. IUCN, Gland, Switzerland and Cambridge, UK. ISBN 2-8317-0502-9. Foose, Thomas J. & van Strien, Nico (1997). 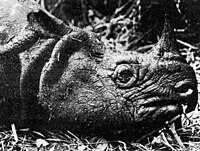 Asian Rhinos – Status Survey and Conservation Action Plan. IUCN, Gland, Switzerland, and Cambridge, UK. ISBN 2-8317-0336-0. Unattributed. 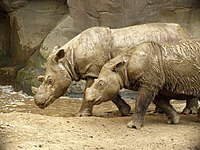 "White Rhino (Ceratotherum simum)". Rhinos. The International Rhino Foundation. Retrieved 7 July 2009.